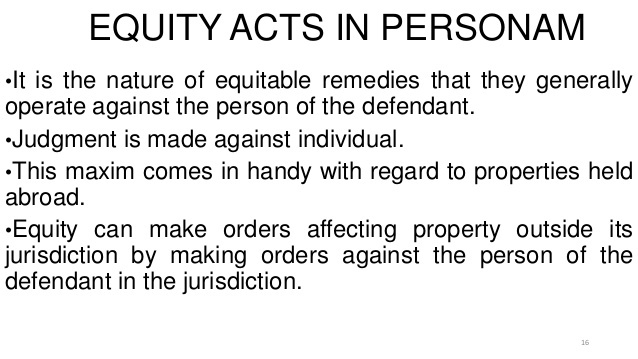 Meaning Courts of equity acts, described as courts of conscience, operate primarily in personam binding the conscience of a person and thus bringing an individual’s conscience under its sway. Its decrees were regarded not merely as decisions concerning the rights and properties in dispute but as decrees, decisions, and directions, positive or negative, addressed to the individual party or parties. Thus on one side an individual’s conscience was sought to be bound and on the other, the Chancellor exercised his jurisdiction guided according to his own conscience. This maxim being descriptive of the equity acts courts’ procedure covers a large portion of its procedural and remedial action. Report on Rupashi Knitwere Limited. What is Meant by Final Account?